This fast-acting surface clamp can be used anywhere you can drill a 3/4 inch (19 mm) diameter hole. The post has a wedging mechanism that allows it to be anchored vertically or horizontally. The raised post collar acts as a material support or as a rub ring to prevent the post grooves from marring the workpiece. Precision machined from brass, steel and anodized aluminum, this is a versatile work support and clamp. The post will lock in a blind hole 1-3/8 inch (35 mm) deep or a through hole in material as thin as 5/8 inch (16 mm) (depending on the strength of the material). With a clamping throat depth of 2-1/8 inch (54 mm), the arm can be quickly adjusted to accommodate material up to 3 inch (76 mm) when the post collar is used as a depth limiter). 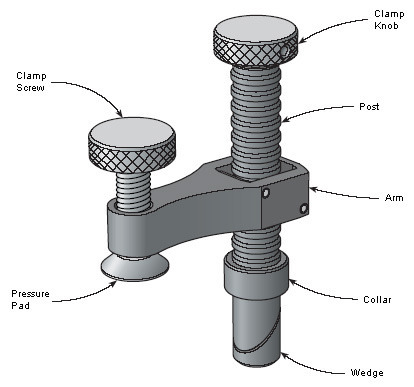 Figure 1: Surface clamp parts. To install the surface clamp, simply drop it into a 3/4 inch diameter (maximum diameter 0.78 inch) hole. Hold the post and tighten the clamp knob until the wedge engages the sides of the hole. It doesn't take a lot of torque to securely restrain the post. Note: The wedge has fairly high mechanical advantage. It is advisable to orient the post so the wedge expands parallel to the grain in the bench top (instead of across it) to avoid splitting weaker material. Adjust the arm so that it allows enough opening for the workpiece, ensuring the hardened steel pins in the arm are located in the grooves on the post, and then tighten the clamp screw to secure the workpiece. To remove the surface clamp, loosen clamp knob until the wedge disengages. Lightly tap the top of the knob if the wedge remains fixed in the hole. Figure 2: Minimum blind hole depth. Figure 3: Minimum work surface thickness.